Hello! I also have a 2008 Kona Jake, and was considering a fork swap. The straight unicrown Kona factory fork is harsh, and I was hoping a fork with more rake and/or curved blades would improve ride quality. 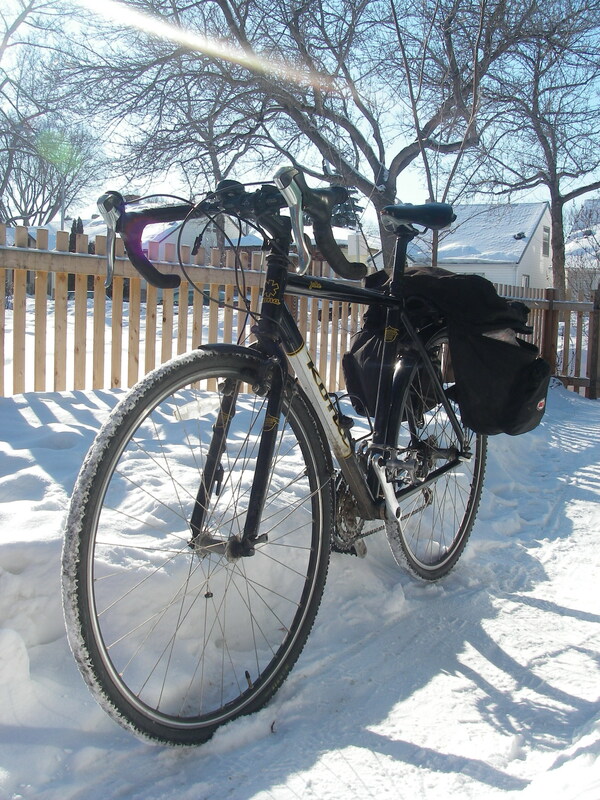 I don’t cyclocross race, it is more of a road or light touring bike for me here in central Montana. Can you let me know how the fork swap affected ride quality and handling? Was it an improvement? Finally, is the new fork considered a touring fork or cross fork? Thanks! I replaced the stock P2 fork with one that came off a Mikado touring bike. It has curved blades and a smidge more rake. The new fork gave the bike much more stable steering especially at high speed. With the original fork I used to find that the steering got very twitchy when I was going down big hills at more than about 40 km/hr. The new fork also gives me better options for mounting front racks. Awesome thanks for the response! Those sound like the same handling traits I would like to address on an otherwise solid bike. Enjoy the rest of your Alberta winter, I enjoy following your sites.